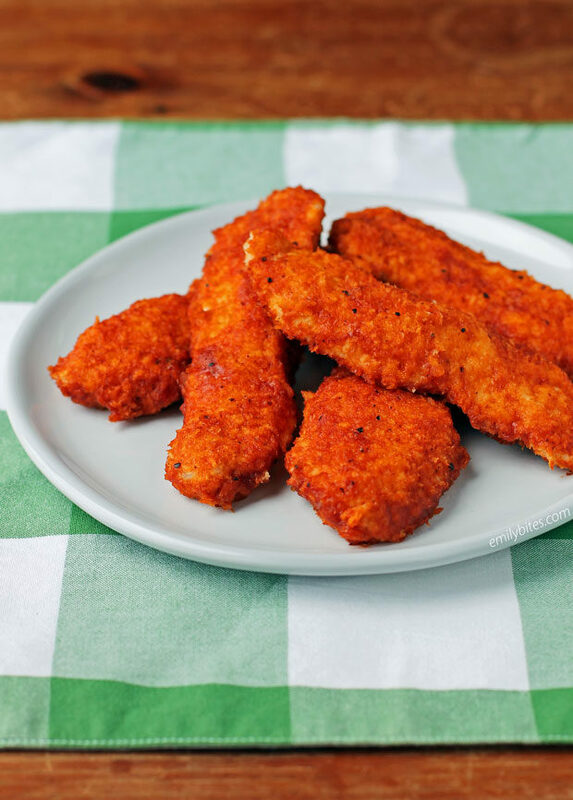 These Baked Hot Barbecue Chicken Tenders are the perfect blend of sweet and spicy, and great for meal time or game time! I’m not sure about elsewhere, but here in Buffalo, Hot Barbecue is a super popular flavor for chicken wings. It’s basically just barbecue sauce mixed with Buffalo wing sauce, but the combination of sweet, tangy and spicy will definitely have you coming back for more. These Baked Hot Barbecue Chicken Tenders are simple to make and much lighter than their hot wing counterparts. You can also easily adjust the heat by adding or reducing the amount of wing sauce to taste. I highly recommend trying my preferred ratio first though – it’s so good! Not only are these Hot Barbecue Chicken Tenders easy and tasty, but each one is only 102 calories or 1 WW Freestyle SmartPoint! I’m not really a big follower of college basketball, but since it’s March, I do think these would make terrific finger food while watching the games! It can be hard to find healthier party snacks or finger foods to munch on while watching sports, but if you want some more ideas, check out my recipe index for appetizers, chili, slow cooker dishes, muffin tin meals, handhelds, and more! If you love chicken recipes like I do, check out my Baked Chicken Tenders, Pimento Cheese Stuffed Chicken, Crispy Cheddar Chicken with Cream Sauce, One Pot Spicy Dirty Rice with Chicken and Sausage, Barbecue Bacon Wrapped Chicken Tenders, Cream Cheese Stuffed Everything Chicken, Chicken Divan, Antipasto Chicken Roulades, Cheddar Ranch Chicken Tenders, Cheesy Bacon BBQ Chicken, Pesto Chicken Roulades, Lemon Pepper Iced Tea Chicken, Cheesy Chicken and Stuffing, Pizza Chicken Roulades, Thai Chicken Skewers, Chicken Piccata, Slow Cooker Buffalo Chicken and many, many more in the chicken section of my recipe index! Pre-heat the oven to 375 degrees. Line a baking sheet with parchment paper and set aside. In a small dish, mix together the flour and cayenne. Place the chicken strips into a gallon Ziploc bag and add the flour/cayenne mixture. Seal the bag and shake to coat the chicken. In a shallow dish, beat the egg whites and set aside. Spread the panko crumbs in a separate shallow dish. 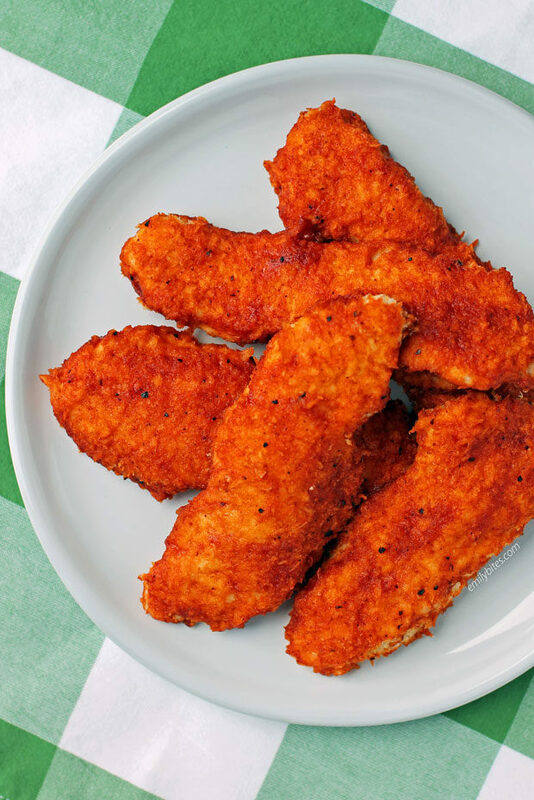 One at a time, take the flour-coated chicken strips and coat them in the egg whites and then press them into the dish of panko crumbs and flip so that both sides are coated in crumbs. Transfer the crumb-coated strips to the prepared baking sheet. When all the chicken tenders are coated and on the baking sheet, spray the tops of them with cooking spray and place in the oven to bake for 15 minutes. While the chicken is baking, stir together the barbecue sauce, hot sauce, and honey until combined. When the chicken is done, remove it from the oven and use a silicone pastry brush to brush all sides of the chicken tenders with the hot barbecue sauce (flipping the chicken to ensure all sides are coated). Return the pan to the oven and bake the tenders for another 10 minutes.